Last year, for Black History Month, I profiled Black American celebrities who traced their African ancestry. This year, still taking it back to Africa, but this time with some great music. I found a mix, by Nigerian Producer Teck Zilla. Teck Zilla, based in Montreal, teamed up with Society HAE to produce an audio-documentary of Fela Kuti and British drummer Ginger Baker, called Fela + Ginger Baker: LIVE! Remixed. 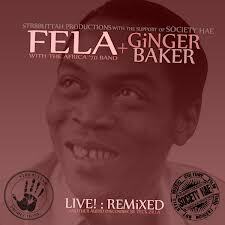 Teck Zilla remixes live recordings of Fela’s 1971 “LIVE!” album. At the same time, he interjects pieces of rare interviews with Fela, his musicians, and Ginger Baker. I reached out to Teck to ask why he was motivated to take on this project. “I can’t say I have a specific reason for putting this together. 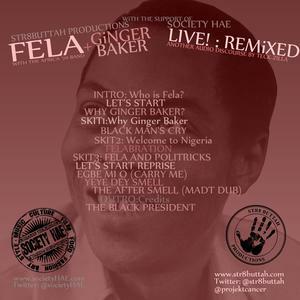 Besides being a fan of Fela and his music, I reckon a look on his side project (with Ginger Baker) would be an interesting theme to continue my audio-documentary series (Afro JETS Club Project being the first) and being that no other Nigerian producer has ventured into anything like this, I felt this was sort of obligatory. Get an intimate look into Fela by giving this mix a listen. Tell us what you think! 3. INTERLUDE1: Why Ginger Baker?